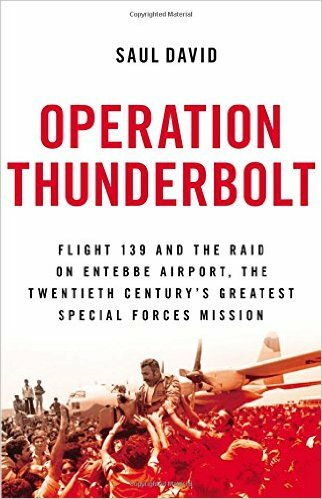 Martin Rubin reviews Saul David's Operation Thunderbolt: Flight 139 and the Raid on Entebbe Airport. The Twentieth Century's Greatest Special Forces Mission in the Washington Times. Since the horrific events of Sept. 11, 2001, it has been fashionable in some circles to express nostalgia for the good old days of hijacking back in the 1970s. It is certainly true that nothing back then was even remotely comparable to Sept. 11, where the vicious destruction and sheer number of lives lost both in aircraft and on the ground would have seemed inconceivable in what were more innocent times in such matters. But the unknowable future cannot figure into events as they are happening. For people caught up in a protracted hijacking like that of Air France flight 139 from Tel Aviv to Paris in June and July of 1976, experiencing terror of imminent death, extreme discomfort and privation, beatings and all manner of psychological torture was a hellish experience all around. The story of this ever more dramatic story culminating in the audacious successful rescue of the hostages by Israeli military forces thousands of miles from home in the hostile territory of the notorious Idi Amin’s Uganda has been told many times on page and screen. But never better than British historian Saul David does in this meticulously researched, vivid account. He has a knack for making the reader feel he is right there, sharing the feelings of everyone from the hapless passengers to the brave, disciplined commandos and the agonized government leaders back home who had to take the leap of faith and courage to authorize a mission they knew could so easily go awry. The hijackers were threatening to kill the remaining passengers unless Israel freed several notorious terrorists. At that time, such a policy was anathema to it, but domestic pressure from the families — deeply concerned that by now only Israelis were at risk of death, having been separated from the others who had been let go — drove them to open negotiations. This was in part a delaying tactic until a rescue operation, if such a thing was possible. Which was very much in doubt, given the enormous obstacles.